Ron Paul and Mike Gravel a little too sane for you? Not to worry â€“ there are even more entertainingly half-baked politicians who think they have what it takes to be our fearless leader. Earlier in the week American Spectator floated the name of Oklahoma Senator Tom Coburn, best known for sterilizing women, extolling the health benefits of breast implants and equating environmentalism with mass murder. â€¦but a Coburn spokesperson quickly shot the story down. OK, whatever that means. But who needs Coburn when weâ€™ve got Cynthia McKinney? Reason Magazine points us in the direction of everyoneâ€™s favorite cop-punching, conspiracy theory spouting former congresswoman, who apparently wants to be the Nader of 2008. At least under the McKinney administration, we will finally know who killed Tupac. Look at all of those states lining up their primaries on Feb. 5. Wow. Even the Governator decided to get Cali a piece of that action: “We want Callee-fornee-uns to have their voices heard.” Well, that’s great. But will they really matter? When you’ve got California, New York, Illinois and about 17 other states all voting on the same day, NOBODY is going to have the kind of money it will take to play in all of those expensive media markets. And as for campaigning, I guess the candidates will make a few airport stops, but does that really change anything (other than maybe causing a few more headaches for air travelers trying to get to their gate)? There seem to be two likely scenarios that will play out, and neither one involves Feb. 5 being the decisive date of the primaries. The first, and far more likely scenario, is that the early states (Iowa, N.H., S.C., Nevada and now maybe Florida) still will decide the race. You’ll almost certainly see the candidates dump their money in those states, so they wouldn’t have much left to spend on Feb. 5 anyway, and the candidate who emerges from those contests (in either party) as the frontrunner going into Feb. 5 will be rubber-stamped thanks to the free media coverage that comes with winning. A considerably less likely scenario would be for no clear frontrunner to emerge from the early contests, and therefore the outcomes of the Feb. 5 races could be all over the map (so to speak). That would mean that the states who waited for Feb. 9 or perhaps even later could end up being decisive. Again, that second scenario has to be considered far less likely than the first — just watch where the candidates place their bets. But the least likely possibility seems to be that the voting mobs on Feb. 5 will determine who the nominees will be. Sorry, Ah-nold — now hurry up and make “Terminator 4” already, would ya? It seems Supreme Court Justice, Darth Vader Ginsberg, I mean Ruth Bader Ginsberg, is unhappy with recent rulings by the court with which she disagrees. So, to protest, she has taken to reading two of her recent dissents aloud to the court. She then went on to suggest that Congress correct the problem under which the majority found the case to be without merit. Now there’s a concept! And it is the perfect illustration of the difference between liberals and conservatives on the court. Darth, by suggesting Congress fix this issue, inadvertently admits that law needs to be changed. Of course she would prefer to, and voted to, simply ignore the law as written or “interpret” it in a way to advance what she “thinks” it should be. The article continues on to talk about how the former Anakin Ginsberg feels “lonely” being the only woman on the bench. Now, I don’t claim to be a feminist, or even to understand women (good lord, there’s an understatement), but I don’t understand how having another woman has anything to do with ANYTHING! It’s work, you’re one of nine judges, you have a staff. If you really feel the need to have women around you, hire them. Though, if you hired someone simply because they’re a women, wouldn’t that be discrimination? Crazy talk, I know. I have just never understood the desire to surround yourself with what essentially amounts to clones. Why can some people only feel comfortable around people just like them? Darth Bader is a Democrat. Aren’t they always pushing for diversity? It seems to me the Left is constantly pushing for standards by which they are completely uncomfortable living up to. Since the media never call them on it, they are free to lament the fact that they are the only woman on the bench rather than just be proud to be one of only nine people on the court. Personally, I would like to see three of every type of person do everything possible, that way we could call it a day on this race-baiting, gender pointing out crap we hear every time someone does something. Does the skin pigment of the pilot of the Space Shuttle really need to be pointed out? Is it really an accomplishment for a minority? Isn’t is simply an accomplishment? I don’t really give a damn what color someone who flies a spaceship is, it’s just pretty damn impressive that they’re flying one. Therein lies the problem with Democrats. They see color, gender, or whatever else can possibly segregate us, FIRST, then whatever accomplishment second. I’ll tell you what, Darth. I bet President Bush would promise to nominate a woman if you help talk Justice Breyer or Souter into retiring. In the name of diversity, do we have a deal? Rudy Giuliani, campaigning in California, continues to walk the tight rope of appealing to enough conservatives to win primaries, while maintaining enough moderate and Democratic support to win the general election. The former NYC mayor told supporters that he is the only Republican in the race with enough liberal appeal to carry left-leaning, electoral-vote-heavy states such as California and New York in the presidential election. Rudy also welcomed the prospect of Fred Thompson entering the race, saying the more the merrier, but he might have another reason to be welcoming. While a Thompson run would certainly take some votes away from Giuliani, it may ultimately benefit Rudy. A batch of Republican candidates split the conservative vote in 2000, allowing the (seemingly) moderate Bush to clinch the nomination. Thompson could similarly split the ultra-conservative vote with Romney and the other more conservative candidates, helping Rudy to win the nomination. As part of my extensive polling on South American sentiment toward America and President Bush, I met with this darling Peruvian girl and her pets on my last day. She is supportive of President Bush’s efforts to expand trade, agrees with him on the need for more funding for a national missile defense system, but was less enthusiastic on his immigration bill. Overall I’m putting her in the “Pro Bush” camp, giving the president a solid 66% approval rating of Peruvians with a margin of error of + or – 100%. This headline opens a whole new avenue of questioning.Â How will Arthur Branch be written off the show?Â Will he just leave town?Â Will he be killed off?Â Will Jack McCoy take over as D.A.? America wants to know. Wayne Berzon of Northbrook, Ill. is not going to be pleased if Barack Obama fails in his quest to become president. 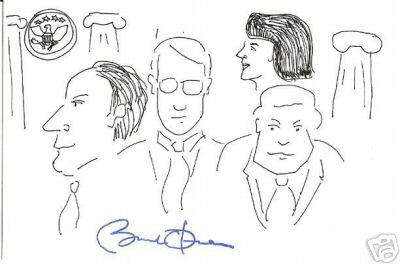 Thatâ€™s because Berzon paid $2,075 for Obama’s doodle of his fellow dem senators (no word on if Obama is subtly accusing Harry Reid of blind leadership). In other news of people throwing money at all things Obama-related, the senator is taking fundraising to Bush-ian levels, planning to take in as much as $2 million in a single event next week. Will Obama beat Clinton again in the second quarter? Fred is in! He will form an exploratory committee by June 4th with an official announcement in July. Bill Richardson is clearly NOT the decider! Governor Bill Richardson, who has the best commercial so far this election season, really stepped in it big time the other day. Richardson claims to be a creature that does not exist in nature: both a Red Sox and Yankees fan. If this is true, it is clearly a sign of the apocalypse. However, since it can not be true, we are safe. For now, this myth will ride off into the sunset on the back of a winged unicorn and be forgotten. Unless, that is, he starts polling more than the atomic weight of hydrogen. Get this woman a dictionary, STAT! President Clinton was always loose with his words, and now it seems Senator Hillary Rodham Clinton has plagiarized a page from his book. How she can in one breath extol the virtues of the free market, and then completely bastardize what the free market is, is amazing to me. On the other hand, the fact that it works and media laps it up like Thanksgiving gravy is sad to me. Where did I get the redistribution part? The earned income tax credit is, let’s face it, welfare. It’s basically someone else’s money given to you because you didn’t earn enough money to pay taxes. I have to assume, given the rest of the article, “simplify” means to give more people more of other people’s money. Which is great, as long as you don’t aspire to ever be in a situation where you will be able to take care of yourself. Kind of how welfare causes an endless cycle of dependence in the first place. More of the same from the same old crowd. Contrary to popular opinion (and the private desires of many, no doubt) I am alive and well in Peru. Here I am looking dirty and smelling worse (thanks goodness Google hasn’t perfected Gsmell yet). And in case you were wondering, yes, I climbed Waynapicchu, the mountain directly over my head. My lungs will never be the same. I was passed on the Inka trail by an 80-year-old man with bad hips and and a woman in a wheel chair. MR. RUSSERT: You spent a lot of time in, in Massachusetts. Are you a Red Sox fan? GOV. RICHARDSON: No, about Mickey Mantle? MR. RUSSERT: You said youâ€™re a Yankee fan! GOV. RICHARDSON: No, no, no. I saidâ€”no, no, no. GOV. RICHARDSON: What I said, the Associated Press asked me, â€œIf you werenâ€™t running for president, if you werenâ€™t running for president, what would you rather be?â€ Iâ€™ve always been a Red Sox fan, but I said if I werenâ€™t running for president I would like to be number seven, Mickey Mantle, playing center field for the New York Yankees. GOV. RICHARDSON: I, my favorite team has always been the Red Sox. MR. RUSSERT: Youâ€™re a Red Sox fan. GOV. RICHARDSON: Iâ€™m a Red Sox fan. MR. RUSSERT: End of subject. GOV. RICHARDSON: End of subject. MR. RUSSERT: You better get rid of this book. MR. RUSSERT: Oh, now, wait a minute! GOV. RICHARDSON: But I likeâ€”Mickey Mantle was my hero. If I werenâ€™t running for president, and the Associated Press asked me, Iâ€™d play center field for the New Yorkâ€”I wanted to be number seven. Andâ€”but I still love the Red Sox as a team. I mean, this is the thing about me, Tim. I can bring people together. I can unify people. MR. RUSSERT: Yankee fans and Red Sox fans? MR. RUSSERT: Not a chance. GOV. RICHARDSON: Well, I bet you I can. The Red Sox? Are we talking about the team of 2008 Republican Senate hopeful, Curt “paint on the sock” Schilling? No…no, no, no. Democrats already ran one Red Sox fan, and look how that turned out. 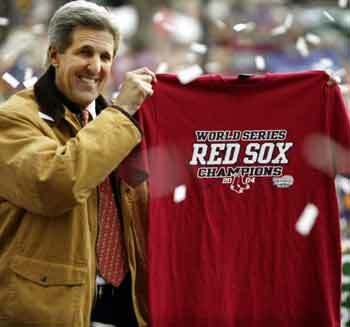 Red Sox fans win presidential races the same way they win the World Series…every 86 years. By the way, I’m a Yankees fan. Some indecisive behavior is understandable and justifiable, and then there is the kind that just makes both sides furious. Democratic presidential hopeful and New Mexico governor, Bill Richardson, who claims to have always been a Boston Red Sox fan, recently said his dream job would be to play for the New York Yankees. Claiming to be a fan of a team is cheered by fellow fans, and grudgingly accepted as a necessary evil by rival fans, but the coddling of each of the archrival baseball teams is inexplicable to both Boston and New York fans. The governor’s statements reveal a deep lack of understanding of public sentiment, and will certainly not improve his favorability rating. Indifference to such a rivalry is acceptable, but claiming to be a big supporter of both leaves the same bad taste in one’s mouth as when a ball game ends in a tie: where no one wins. Likewise, Richardson won’t win anything without the ability to take a stand on, in the scheme of things, such a minor league issue. Rumors abound that Fred Thompson has made his decision and that the announcement will come at a time near the July 4th holiday.Â Is this the final rumor before the announcement or more of Fred’s “unconventional” campaign to keep us interested? There may be evidence that the announcement is coming. Mitt Romney apparently lost a key backer just before the weekend.Â US Representative Marsha Blackburn of Tennessee, who came out in January for Romney, announced that she will now back Thompson if he runs. Almost on queue, Thompson posted his Memorial Day thoughts at Townhall. This is our quandary. Memorial Day is about remembering. Itâ€™s about remembering those who died for our country; but it’s also about remembering why they believed it was worth dying for. Too many Americans, though, have never been taught our own history and heritage. How can you remember something that youâ€™ve never learned? So Fred, when does school start? The warm weather has arrived, so it must be flip-flop season! The last GOP debate found Republicans attacking each other over changing views on several issues. Most notable was John McCain’s assertion that he, unlike Mitt Romney, hadn’t changed his positions “on even-numbered years” or “because of the different offices” for which he was running. Romney claims he became pro-choice when a relative died after undergoing an illegal abortion, but has now returned to his pro-life stance. Such a lack of ethics evinces memories of a teary-eyed Al Gore blaming cigarettes for the death of his sister, despite his thunderous declaration to tobacco farmers that he supported and was one of them. Now, soon after the Democrat-controlled Congress gave in on their Iraq timetable, Barack Obama and Hillary Clinton are getting attacked on multiple fronts for their votes and related flip-flopping. Rudy Giuliani accused the pair of moving from an anti-war to an anti-troops position, Republicans in general lined up to say the Democratic senators are soft on security, and John Edwards criticized Congress as a whole (of which he is conveniently no longer a part) of failing America. A week ago, Clinton and Obama voted to advance a measure that would cut off funding to force a troop withdrawal by March 2008. Last year, the two voted against setting a timetable for a pullout, and until recently had avoided any notion of eliminating war money. So flip-floppers abound. Which begs the question of whether it is better to stand for something, and maintained a principled stance (whether deemed right or wrong), rather than pander to the often radical wings of your party. When you are so inconsistent, as Romney, Clinton and Obama have been, you open yourself up to bashing from rivals on both sides of the aisle. Naturally, the pre-recorded response of, “It is time to stand up and do something,” raises the question as to why it wasn’t it time before. The “I realized that I was wrong” strategy (though not in the Clinton playbook) often doesn’t fair well in the public eye, as it is difficult for a candidate to sell a flip-flop as a genuine change of heart, rather than have it projected as a mere ploy to do/say anything to gain some votes. Such lack of conviction leads to distrust from both sides: the resentful abandoned group, and the newly suspicious comrades. Considering the public’s general distrust of politicians, a little honesty and consistency could go a long way for a presidential candidate. Meanwhile, there is more insanity going on as not only are the candidates jostling for position in the 2008 Presidential race, but the states themselves are jockeying for position in the primary run due to start in 2008. Or will it be 2007? With months left until the September deadline to set a date for their states, the traditional early birds, Iowa and New Hampshire, have waiting to see when some other states decide to schedule their primaries. With both Iowa and New Hampshire sporting laws regulating how close another state’s primary can be to theirs, the candidates face a possible New Year’s or even Christmastime event in one or even both states. At this rate, expect candidates for the 2012 Presidential race to start their exploratory committees within the next few months. This now leaves South Carolina as the wild card for the final positioning of the first tests of the 2008 Presidential election. Don’t expect this race to become any clearer than the real race before September. She’s already had to put out a fire caused by a leaked memo from her campaign advising her to give up on Iowa, just after getting geeked in a couple of Iowa polls. Now a primary poll comes out showing Hillary Clinton trailing, ever so slightly, in the Sunshine State of Florida? And I hear she has a really fun vote to cast this week, too, on her favorite topic: Funding Bush’s debacle in Iraq. How she votes on this could provide another interesting clue as to how comfortable her campaign actually is about her prospects for winning the Democratic nomination. Ron Paul continues to remain hugely popular in cyberspace, if not in the real world. Despite the verbal beating Rudy Giuliani rained down on him at the last GOP debate, Dr. Paul has been maintaining his impressive showing with the tech-savvy Internet crowd. The 10632 subscribers to the Congressman’s youtube.com channel easily trump the showing of all other presidential hopefuls, both Democratic and Republican. Leading Democratic horse, Barack Obama, is currently a distant second with 5776 youtube subscriptions. Though he usually registers in the low single digits in polls, Ron Paul’s support has consistently been at on near the top in such popular online venues as youtube and myspace. If Paul is to have a chance to stay in the race, he will need his online pals to get off their computers long enough to start showing up in real-world polls and voting booths. A few months back PoliticalDerby caused a mini internet ruckus by suggesting that the dream dark horse for 2008 was not Al Gore, but in fact Apple’s own Steve Jobs.Â We actually had people from Amsterdam commenting on the suggestion. Well, Mr. Jobs is clearly not on board. Apple CEO Steve Jobs has stated that Al Gore, an Apple board member and former US vice-president, would win the presidency if he ran for election. MyFox Chicago has an online segment on the burgeoning presence of hate groups in the South and the possible motivation behind Barack Obamaâ€™s recent secret service appointment. The Grand Wizard of the Ku Klux Klan provides a statement in the video, reinforcing what I consider to be the popular sentiment towards the group: Itâ€™s mostly a laughable attempt by old, white men with goofy-looking facial hair to feel influential about something.